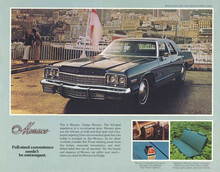 By 1975, the range consisted of the Dart, Coronet, Charger and Monaco. The Monaco was the most luxurious and therefore most expensive version of the Polara. The Monaco two door coupe in 1972 cost $4,153 compared with $3,641 for a standard Polara with the same body. Customers could choose two or four-door coupe, four door sedan, or five door estate. The estate had room for six to nine persons. Dodge had stopped building convertibles now that almost every car was equipped with air conditioning.